SNK’s King of the Monsters 2: The Next Thing. If the first thing that comes to your mind is a giant fire-breathing lizard scraping tooth and claw against another mutant creature as they both lay waste to a city – then awesome – because that is what this classic Arcade game has to offer in ten fold. But if you’re still scratching you head, wondering what crazy nonsense I’m spouting this time, then right now is the perfect place to humbly welcome you into the monster-filled world that is Kaiju. “Konichiwa!” as our friends from across the Pacific would kindly say. Greetings aside, Kaiju is a sub-genre of any Japanese live-action film or television drama that typically features beast-like monsters, the most famous of these being Godzilla. In fact, the big-green machine himself made his first silver-screen appearance over fifty years ago, and has since then stared in 28 featured films. That is a lot of movies, and when you include the other Kaiju inspired works that have spawned since the age of the drive-in movie, the list is lengthy. From King Kong, to Ultraman, and that turtle-flying hero himself Gamera, there are a multitude of other giant creatures that have gotten their own big-screen title around the world. The quality of these films, is yes, questionable, with the majority of which being right-down laughable. But for fans, including myself, we know that that is part of the charm, the lovable whimsy of such science fiction/horror films. There’s nothing more fun than watching mini-recreated city sets being destroyed by a guy in a rubber monster suit, explosions here and there, and dose of wacky sci-fi hi-jinks mixed in for good measure. 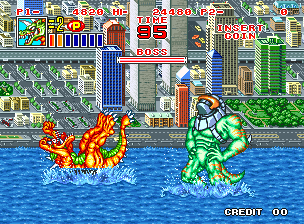 It’s certainly that same passion for the Kaiju sub-genre that is the basis for the King of the Monsters series when the first installment hit arcades in 1991. In King of the Monsters, you select any one of six monsters, each with their own set of special attacks and attributes, to do battle in a simple fighting/wrestling game. Really I should say that the game plays more like a wrestling game, which takes place in city-sprawled arenas, then anything else. More like “King of the Monster Wrestlers” to be fair. You can grab your opponent and throw them against an invisible force-field that acts more like the ropes on a wrestling ring. Plus in order to win anymatch in King of Monsters, just like any wrestling event, you must pin your rival for the traditional three count. The game is pretty much no more or no less. 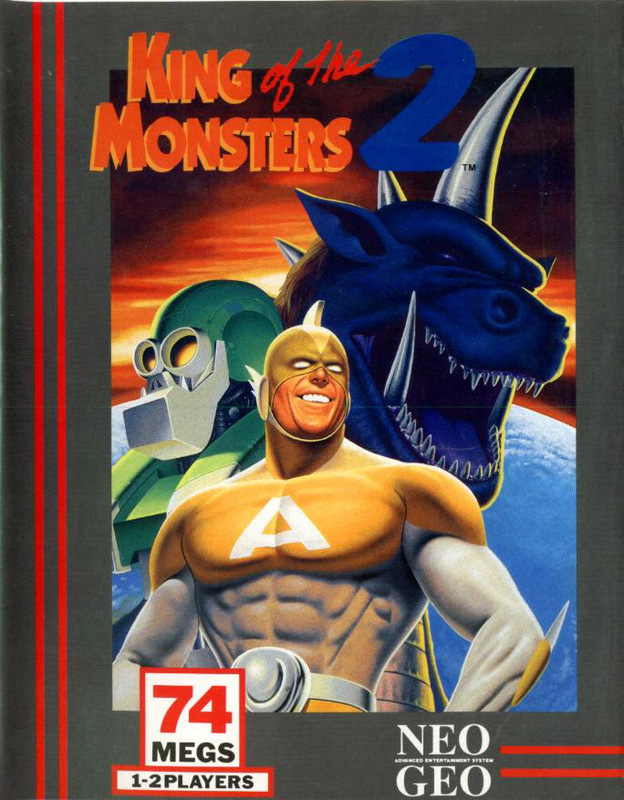 And that would have been alright if there was never a King of the Monsters 2, which in my opinion offers some much more in presentation and gameplay. It’s night and day with each title thanks to a simple addition of another Arcade-genre staple. King of Monsters Above, King of Monsters 2 below. 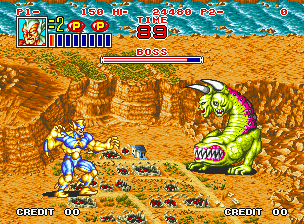 With King of the Monsters 2 a year later, SNK kept only three monsters and the combat system but added further depth by going the Final Fight beat-em up route. It’s that added style which gives the game a new layer of fun, keeping things from getting boring pretty quick unlike the first. That’s because you don’t have to pin down to win this time, just beat all that stands between you, including the level’s end boss. In King of Monsters 2 you now have some neat details to help you on your way, such as power-ups that up your attack strength and special attacks. You can also pick up and throw buildings and assault vehicles now too. Something you would have thought would have been in the original, but wasn’t. Better late than never I guess. Truthfully King of the Monsters 2 is just the better polished game over the first, and is the one that you should seek first. The music is livelier and the visuals a tad bit more brighter and colorful than the original. I would say the only things that keep King of the Monsters 2 from becoming great are the grappling mechanics and stingy difficulty that can burn away any enjoyment. While battling against your foes, the grappling gets messy and tiring. You have to forcibly tap the A button in order to get the upper hand, but sometimes it feels that no matter how much you do, the computer still has its way. That goes along with the harsh difficulty too. You will be eating up numerous continues after your character gets defeated – and I mean it. So if you are the type that doesn’t have the patience or neither the interest to begin with, then you might want to steer clear. Those complaints aside, if concepts of controlling a giant monster and smacking the guts out of other monsters are enough to string you along for a good half and hour or so, which is alright by me, then King of the Monsters 2 is a recommended try. Now how do you get a chance to play this game? Well it seems I have the uncanny luck, again, of picking games that are not available yet on any official download service. With King of the Monsters 2, that means tracking down a Neo Geo arcade unit or home console. And unless you have the money and hours to waste on Ebay to do so, well I can understand going with emulation. SNK, along with fellow Japanese game company Takara, did do two ports of the Arcade version, one for the Super Nintendo and Sega Genesis, both having their own special traits. The Super Nintendo version is almost a carbon-copy of the arcade one with some graphical and sound processing down-scaling to help the game fit on the cartridge. Super Nintendo version above, Sega Genesis below. Meanwhile the Sega Genesis port ditches the beat-em up theme and goes back to the fighting game premise in the original King of Monsters. Now according to which ever message board you hang out on, the Sega Genesis is the above-all best version of the game. Notably because, the Genesis port has the right difficulty level and is a lesser nuisance when dealing with the grappling mechanics. Personally, I say if you can try both, go for it. Find which version, either Arcade or Genesis, is best for you. In the end you’ll still come away satisfied in your need to smash buildings and fight off aliens from sizes big to really really big.